Roman Kreuziger (Astana) salvaged his Giro d’Italia today when he hung on to win the brutal 19th stage to Alpe di Pampeago. 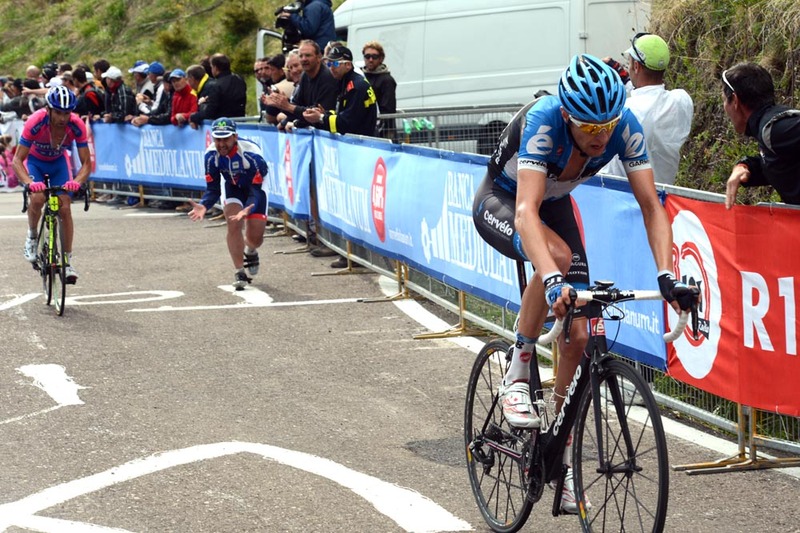 The Czech fell out of overall contention when he lost over 11 minutes on Wednesday’s leg to Cortina d’Amprezzo. But he was able to turn around his fortunes when he attacked on the penultimate climb of today’s stage and picked off the survivors of the day’s early breakaway. By the line Kreuziger had all but destroyed himself, but he took the stage by a margin of 19 seconds. Behind him Ryder Hesjedal (Garmin-Barracuda) claimed second place to gain time on all of his overall rivals and move to within 17 seconds of Joquain Rodriguez’s (Katusha) pink leader’s jersey. With the Canadian having turned the screw in the final 2.5km, the rest of the favourites crossed the line in dribs and drabs behind him. With a last ditch effort in the final kilometre, Rodriguez overhauled Scarponi for third place on the stage at 32 seconds. Despite having had his Liquigas team set the pace for much of the stage, Ivan Basso lost the best part of a minute and slipped from third to fourth overall. Sky’s Rigoberto Uran finished with him to maintain his grip on the best young rider’s white jersey. His team mate Mark Cavendish came in with the ‘autobus’ to keep his red points jersey for the time being. Stefano Pirazzi (Colnago-CSF) and Sandy Casar (FDJ-Big Mat) set the early running after escaping from a larger break on the first time up the Passo Pampeago at the start of a 45km finishing loop. Thomas Rohregger (Radioshack-Nissan) and Emanuele Selle (Androni Giocattoli-Venezuela) briefly rejoined them before the finishing ascent of the same climb but were dispatched, as earlier, on its lower slopes. Kreuziger meanwhile had set off from the main group of favorites on the intermediate ascent of the Passo Lavaze, joining Dario Cataldo and Serge Pauwels (both Omega Pharma-Quick Step) before the summit. After continuing the chase down the descent, he dropped his two companions and worked his way through the four remaining riders up the road. Of the main chase group a minute or so behind, Scarponi was the key protagonist attacking no less than three times. Hesjedal was the quickest to respond each time with Rodriguez on his wheel. But after following through on Scarponi’s third attempt with 2.2km to go, Hesjedal saw daylight emerge between his rivals. Rodriguez and Basso distanced, he eventually dropped Scarponi as he entered the final kilometre. After today’s monster stage which went over five classified climbs, the racers face an even more ferocious day tomorrow. Following three mere lung-openers, they’ll tackle the fearsomely steep Mortirolo before -weather conditions permitting- finishing at over 2750m above sea level on the Stelvio. If that doesn’t decide the overall, all will come down to Sunday’s 31.5km time trial in Milan.